Fifty WSU Vancouver students found themselves charged up by the electric enthusiasm of fellow WSU Cougars fans as the WSU football team beat Oregon on Oct. 26. Tyler Knaus is a WSU Vancouver student but still bleeds crimson and gray. 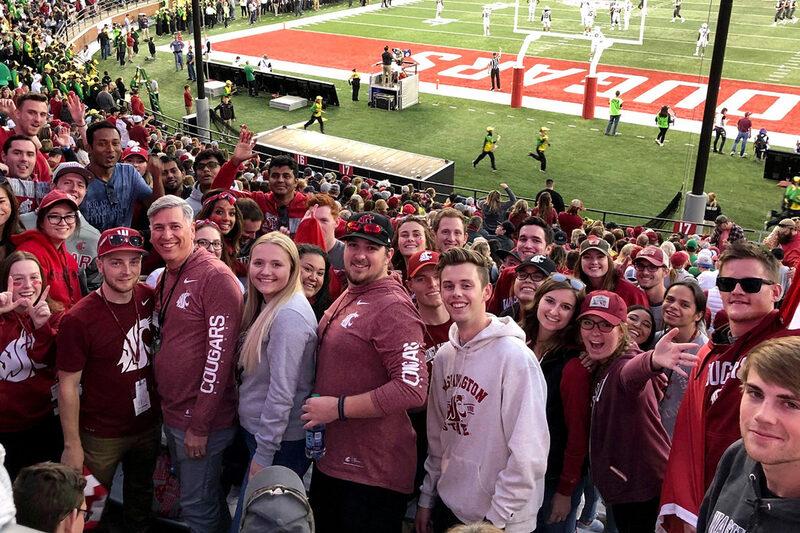 Any question about that was laid to rest Oct. 20, when the senior electrical engineering major was among 50 students from the Vancouver campus who traveled by bus to Pullman to watch the Cougs beat Oregon. Adding to the experience was ESPN College GameDay, which broadcast live before the kickoff from the Pullman campus for the first time ever. “It was a dream come true, I was blown away with the atmosphere around GameDay, and the whole trip was amazing,” said Knaus, explaining it was the first Cougar football game he’d been able to watch in person. The trip was part of an effort to help boost Cougar spirit throughout the WSU system. The Vancouver campus also helped send about 50 students to Corvallis for the game against Oregon State two weeks earlier, and last year sent a dozen students to the USC game in Pullman. The coordination between WSU Vancouver and the Pullman campus is a part of the University’s effort to create a “One WSU mindset,” said Ellen Taylor, an associate vice president at the Division of Student Affairs. Taylor said she’s open to finding ways to continue the effort. Knaus has been a fan of Washington State his entire life. He said the Pullman campus was of interest to him back when he was in high school deciding where to go to college. He ultimately decided on the Vancouver campus for its prestigious electrical engineering program and so he could stay close to home. Chairman of the board for WSU Vancouver Student Activities, Travis Toth, said that because of the recent success in sending students to Pullman, the board will look to make an annual trip to Pullman and possibly Eugene or Corvallis. “I can definitely see this becoming an annual event for any of our students outside of the Pullman campus,” Taylor said. For now, this opportunity gives WSU students like Tyler the chance of a lifetime.